In the recent days the demand of pepino melons has increased due to their many health benefits. Its demand is in increase each day. It is a herbaceous fruit mainly grown for its juicy and cramatic fruits. The fruits is typically a bright green or yellow green and often has some red or purple stations. The flesh is golden yellow when ripe with a narrow seed cavity. The melon is entirely edible skin, flesh and seeds. The fruits are very sweet and juicy. It should be eaten only when ripe. Breaking down into glucose for great energy to get you through your day and increases stamina. It helps with liver disease, lower blood pressure, helps those that suffer from strokes to heal faster and promotes cardiovascular health. The fruit helps to prevent cancer and diabetes (tends to regulate blood sugar levels because of the high fiber content) plus it lowers cholesterol. Pepino melon is anti-inflammatory in action helping to sooth away your aches and pains. Pepino melons has lots of vitamin A,C,K and also B vitamin, proteins, plus iron and copper which are essential for a healthy immune systems and calcium for bones, potassium which is needed for relaxing and lowering blood pressure and pepino is a good diuretic. Pepino melon has soluble fiber similar to act meal which also helps to lower cholesterol and it’s easy to digest. The fiber also helps with constipation and it tends to sooth away gastric ulcers too. The pepino melon is also sodium free decreasing your daily intake of sodium lowers your blood pressure and reduces your risk of developing illness related to high blood pressure, such as heart disease and kidney disease. After 3 months of maturity each pepino melon can produce a minimum of 150 fruits per year. If we work with the minimum you can get 150,000 fruits per year. If you sell the fruits with the least price of Sh 30 per fruit you will get Sh 15,000,000 every year. The life span of the pepino melon is more than 2.5 years. 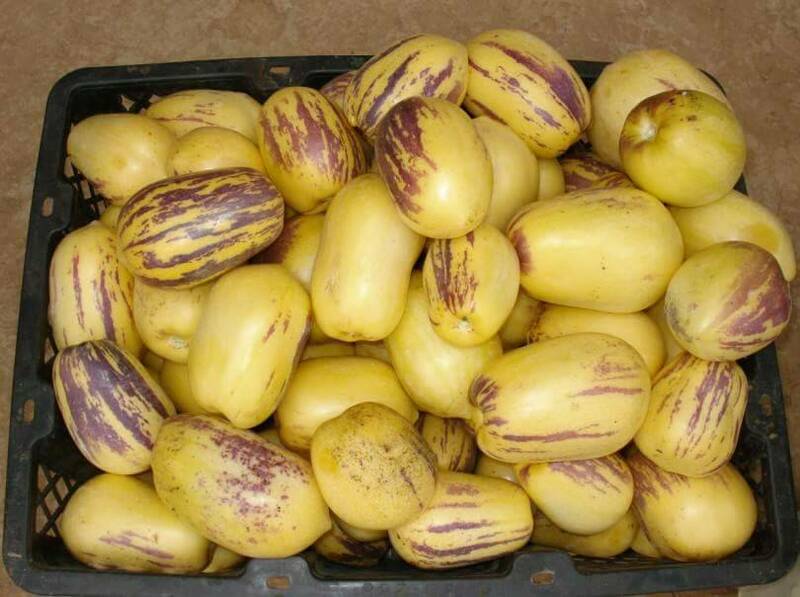 Pepino melon is one of the profitable fruit we have in the country. Its future is promising as most countries like China and Chile have discovered how to extract the medicine value in the fruits and package. If you can’t plant them for commercial purposes make sure you get some for family consumption. We have certified seedlings from our seedbeds. _Has lots of vitamin A,C,K and B,proteins,iron and copper which helps in healthy immune system,potassium which lowers blood pressure and calcium for strong bones. carbohydrate your body does not digest.The fiber in the melons slows digestion helping you feel longer. _Helps in weight loss due to their low amount of calories.All the calories in the pepino melons come from its carbohydrate content. pressure,helps those that suffer from strokes to heal faster and promotes cardiovascular health. illness related to high blood pressure such as heart disease and kidney disease. _Pepino fruit is also beneficial to increase stamina.Herbal products from China are made from raw pepino now widely sold in Indonesia. _The content of vitamin C in pepino 25 Mg per 100 grams of fruit fresh,vitamin c aids in preventing oral thrush and to maintain healthy gums. _In addition to vitamin E vitamin C is a natural antioxidant useful against free radical attack,causes premature aging and various types of cancer. The above benefits on the super fruit shows the need to venture in pepino melon fruit business or have a few for family use.Ensure you take one daily. Dickson kahuro from Oxfarm Ag LTD was hosted by kameme TV as agronomist to educate Pepino melon farmers and consumers on why you should farm Pepino melon. Watch the youtube link that entails all what was discussed and for more information on market, it’s benefits the seedlings, fruits and farm visits, visit our offices in Nairobi, Nyeri, and Eldoret or contact us Oxfarm /money grows on trees. 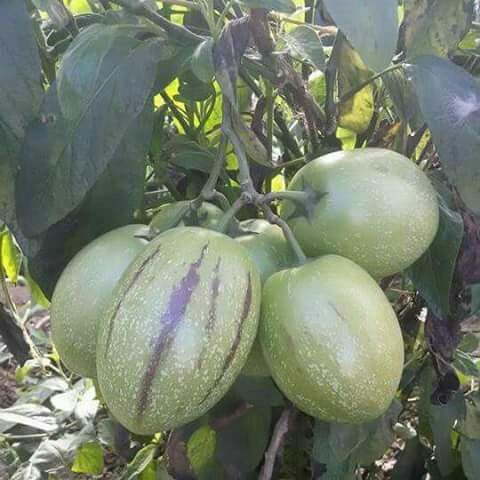 This is a question that everyone in need to invest on anything have to ask, From the time I started healing of this warder fruit pepino melon in Eldoret two years back the prices has always been retailing between 70 – 100 per fruit. Many farmers are still waiting for it to be like quail and they will wait longer maybe for lifetime, Many people in urban are realizing the benefits accruing to this pepino fruits and other fruits and they are buying in big numbers also because of doctors’ advice, currently we cannot meet the demand of the orders we are getting daily because first we don’t have serious famers into this business second farmers are buying seedling for testing whether it will work but not for business. To be serious in anything you have to consider about quantity of what the market needs. China is extracting the medicinal value from pepino fruits so never think that we will ever satisfy the market. 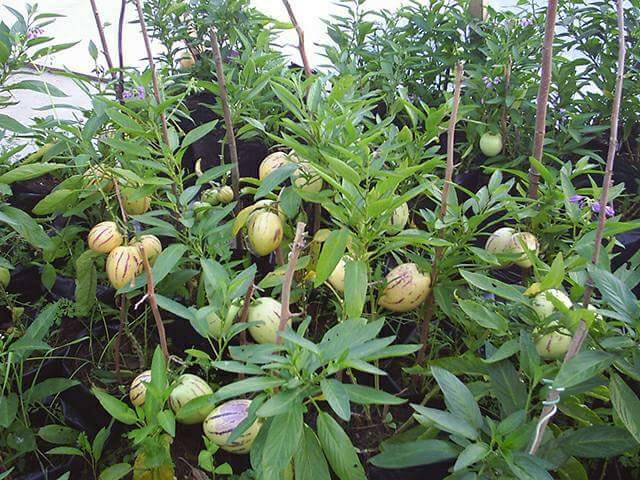 The lowest price according to our analysis as oxfarm organic ltd if all farmers were to plant this plant, is ksh20-40. The following are condition necessally for growing the plant organically. Require a soil ph. of 6.5 – 7.5 in a well-drained soil the other ecological weather condition are the same as those of potatoes. Require a spacing of 3ft by 3ft hence an acre with a space of 43560 square feet can accommodate 4000 plants comfortably . Other requirements include water source, manure, pesticides and fungicides.  Prepare your land to attain fine tilth assuming you have tested your soil from recognized body like KARI.  Dig holes at a spacing of 3ft by 3ft to attain a plant population of 4000 seedlings.  Add per hole a hip of well rotten manure in this case of organic farming don’t add any fertilizer in your soil but instead add ash and mix well with the top soil.  Apply enough water when planting in case of dry weather like the one in this season of January – March. With all the information on farming pepino, farmers are still not getting the potential harvest from these plants. A single plant has the potential to give a minimum of 200 fruits and above per year, mostly what happens is that they flower well but after sometime the bearing fruits drop. We have experienced this on our farms but we found that the cause of this problem mostly it’s because of two reasons. Inadequate nutrients or lack of enough water, a big percentage of water melon fruit is composed of water hence require enough watering. In case of inadequate nutrients add manure and ash, mostly when practicing organic farming ash act as a big role in the soil for many reasons I will share with you another time. Most common pest that attack pepino plants include red spider mites and cut worms and can bring severe losses if not controlled in time We use pesticides to control them and fungicides to control against frost. In case you have ever grown or visited our farm with pepino melon there are two varieties. There are those that seem resistant to frost and pest while there are those that are easily affected hence poor quality fruits and low productivity. We have sorted our seedlings well in our farms which we sell to our farmers. visit our offices in Nairobi Hermes House first floor opp K.T.D.A Tom Mboya Street or Nyeri Kimathi way Behind Khimji Devshi bookshop next to HFC Bank. A well-managed pepino plant can produce on average more than 200 fruits for a whole year. Currently a fully ripe yellowish stripped middle sized fruit is retailing at 100 in our area market, when selling directly to the consumer. But in our case let’s assume we sell to a middle man at Ksh 20-50 and achieve plant population for an acre 3600 plants that give a production of more than 100 fruits for one year i.e. 30*3600*100 = 10.8 million. This means you can get 900k per month or fetch 225k per week real money. You just have to wait for 3 months for the pepino melon to start fruiting.